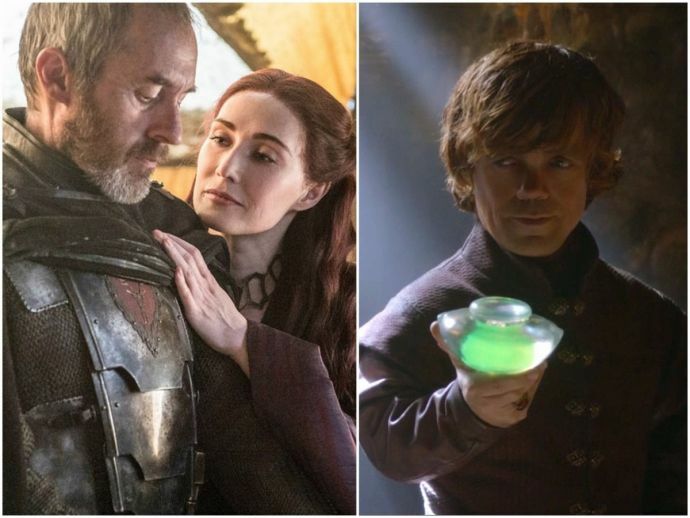 Down The Memory Lane: Top Moments From Game Of Thrones Season Two! Ahead of the premiere of season 7, we bring you a recap of season two. 1) In Dragonstone, Davos, Stannis Baratheon's henchman, recruits the pirate Salladhor Saan to Stannis' side. Stannis then mates with Melisandre for a son his wife cannot give him. 2) Theon Greyjoy returns to his home of Pyke after nine years as the Starks' ward. He is reunited with his sister, Yara, and father, Balon. They despise Theon for his Northern ways and he intends to win back his crown by force. 3) Stannis was surging and King’s Landing was vulnerable, but Tyrion planned for the Battle of the Blackwater. The battle offers our first substantive exposure to wildfire, the green napalm-like liquid that will come around again a few seasons later when Cersei blows up her enemies. 4) Tyrion takes up his post as acting Hand at King's Landing. Much to Cersei’s dismay! 5) Renly Baratheon is killed in his tent by the smoke baby of Stannis and Melisandre’s born out of darm magic and witchcraft. 6) Catelyn Stark is lured into setting Jaime Lannister free in return of her daughters as promised by the “Littlefinger”. Thus begins the journey of Jaime Lannister and the female warrior sent along with him as his protector, Brienne of Tarth. 7) Robb Stark falls for and marries Talisa, the nurse in rebellion of his deal to marry one of Walder Frey’s daughter. 8) Bran and Rickon flee with Hodor and Osha after Theon takes over Winterfell. Thus starting a magical mystery of Bran’s dreams. 9) Daenerys’s conquest on Qarth is short lived as the pompous men who run the city first refuse to support her in her quest for Iron Throne and then steal her dragons, forcing Daenerys and her growing children to set ablaze their first victim. 10) Closing this one with the mushy moments between the Snow and Ygritte. This season brought us their smoldering romance leaving us wanting a bit more! Don't tune out or you'll miss out season 3 here!